This is a beautiful centerfold picture from the German entertainment magazine Bravo. I've scanned it in two parts because there wasn't room for the whole thing on my scanner, and so that the quality isn't diminished in a smaller scan. Thanks for the awesome photo. The guys look so young and vibrant. They certainly were photogenic in those days. Oi! Clarkey! What's with the crimson shirt, green tie and white polka-dots?!!! 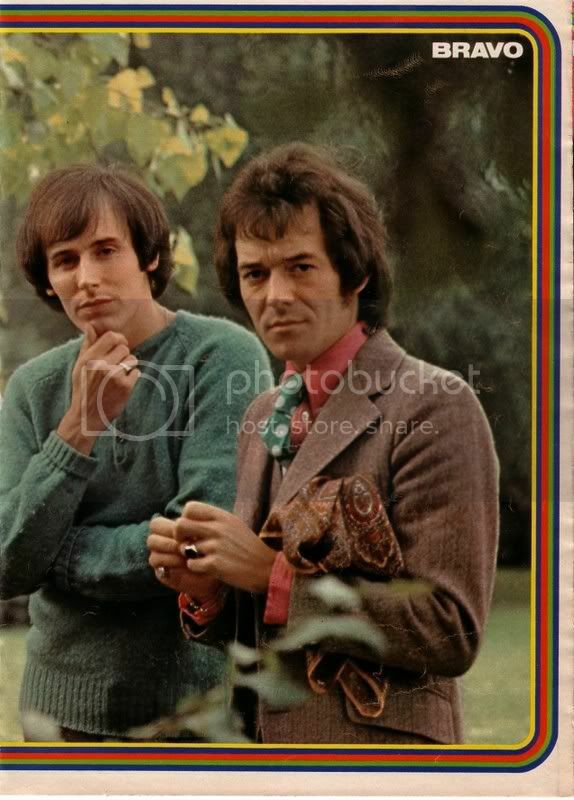 This is a very nice picture of The Hollies. I am a German and know the BRAVO magazine which still exists. It would be interesting for me to know whether there is an article about the band in that magazine, as well. You're welcome, guys! Yes, they were very photogenic and handsome. I like Allan's outift. I think he looks adorable! No, Benny. There was no article with this photo. I think there are some issues out there with articles on the boys plus beautiful color photos of them. I'll see if I can find any. If I post one with an article, can you please translate it? I would like to Thank You too Vrinda, that's a lovely photo and one of the best photos I've seen of them. 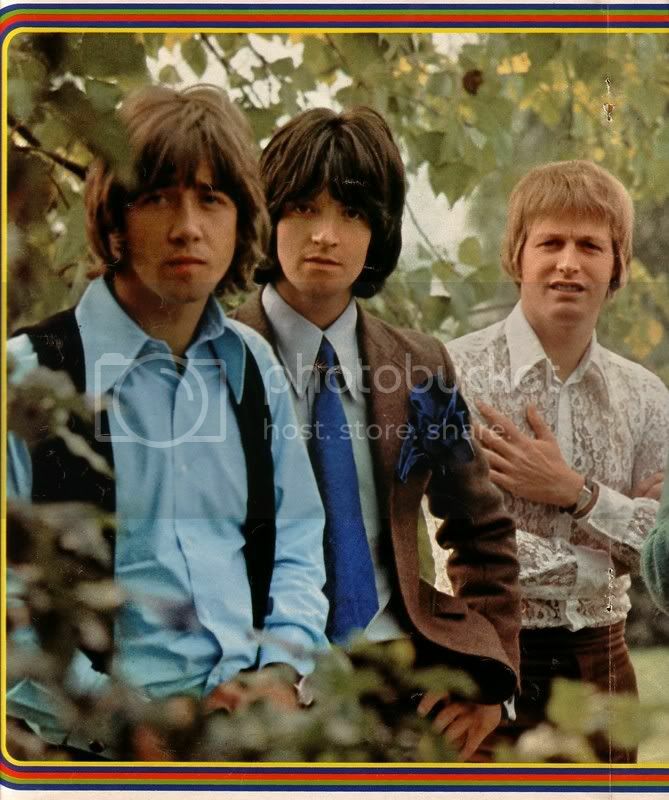 Bernie was so cute in those days and Allan, Terry, Tony and Bobby weren't bad either. Love Allan's Shirt and Tie, wonder if he still has them?. if the article you post is in German I can do my very best to translate it into English. I would do that, of course. Thanks, Susie and Benny! When I find such an article I'll post it. Yes, Susie, I wonder if Allan still has that outfit, too! Only he can get away with dressing like that! The Hollies circa 1970 look smashing. They're pop stars, remember? It's funny; it seems the people who claim to not have any interest in fashion are the first to take note of the way somebody dresses. I applaud anyone who wears colour; I live in Hollywood, and this is supposed to be the land of technicolour. It's not. Most people wear the drabest, most colourless clothes today, pop stars included. I couldn't agree more, Dennis. Celebrities today have awful taste in fashion. They dress like they're going to clean the garage everywhere they go. My mother's cousin lives in LA, right across the street from CBS's headquarters, and sees actors and actresses going in and out every day, and she doesn't have too many nice things to say about their appearance! Wearing bright colors has to be done in good taste. It can go overboard, like in David's case. Begging the question, who is David Beckham?